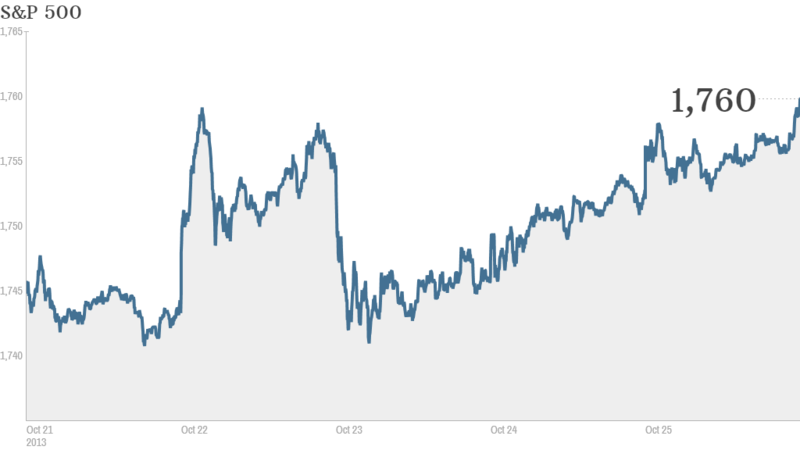 The S&P ended the week on a record high. Click chart for more markets data. Traders will have their eyes on Washington this week -- but not because of a shutdown or debt standoff. They'll be looking to the Federal Reserve. The Fed's policy committee wraps up a two-day meeting on Wednesday. It is highly unlikely to dial back its $85 billion monthly stimulus program that has helped to send stocks soaring this year. Many investors had expected the Fed to announce it would cut back, or taper, its purchases of bonds and mortgage-backed securities at its meeting last month. But the Fed held off on doing so, saying it wanted more evidence of economic growth. This month's government shutdown may further muddle the economic picture. So when will the Fed finally start to taper? It's possible Chairman Ben Bernanke, who will be stepping down after his term expires early next year, will leave that decision to his successor. Fed vice chair Janet Yellen has been nominated by President Obama to replace Bernanke. She still needs to be approved by the Senate. Related: Who is Janet Yellen? Investors will also be watching earnings this coming week. Results from many big companies that reported last week were mixed. But they were good enough to help lift the Dow, S&P 500 and Nasdaq to weekly gains. The S&P 500 ended the week at a record high. Yearning for more earnings: Apple (AAPL) reports its earnings after the closing bell Monday and it could be another weak quarter for the tech giant. Analysts are expecting profits to fall from a year ago while sales are only expected to rise slightly. The report could shine some light about how the latest iPhones -- the 5S and less expensive 5C -- have sold since their debut last month. Investor Carl Icahn has urged the company to pour its cash into a larger share buyback than the company has planned in order to boost the stock price. Nokia (NOK), an Apple competitor which recently announced new phones and tablets of its own, reports earnings on Tuesday. Nokia is also in the process of selling its mobile device business to Microsoft (MSFT). Herbalife (HLF), the controversial nutritional supplement company that hedge fund manager Bill Ackman is betting against, reports results on Monday. Icahn, who has engaged in a nasty public feud with Ackman, is Herbalife's largest shareholder. Social media firms LinkedIn (LNKD) and Facebook (FB) will report earnings this week as well. Investors will be hoping to see more evidence of mobile growth from Facebook -- especially since Twitter, which is expected to make its market debut in the next few weeks, has disclosed that it is performing extremely well in mobile. General Motors (GM) will report earnings on Wednesday. Expectations are high for GM after Big Three rival Ford (F) reported solid earnings last week. Starbucks (SBUX) reports earnings on Thursday. The coffee seller's stock is trading near an all-time high and CEO Howard Schultz has been in the news often due to his views about the dysfunction in Washington. Sprint (S) and Exxon Mobil (XOM) will also be releasing results this week. No "Jobs Friday" this week: The October jobs report originally scheduled for Friday will come out a week late due to the government shutdown. But investors will still get a glimpse of what jobs growth was like in October. Payroll processor ADP (ADP) will release its monthly report on hiring in the private sector. Economists surveyed by Briefing.com expect that 125,000 jobs were added in October, down from 166,000 in September.